Let me begin by extending to the friendly people of Turkey, warm greetings and good wishes from the people of India, the Indian Government and from my own self. I would like to express my appreciation to the Istanbul University for honouring me today with the Doctorate, Honoris Causa, in Political Science. I am privileged to receive this honour from Istanbul University which, like the city itself, is steeped in history and has been a bridge connecting two disparate land continents and civilizations. I am indeed proud and privileged to be here. There is a 200 strong Indian diaspora in your beautiful country, which is a vibrant community in its own right. Their ethos, experience and expertise help in cementing stronger ties of friendship, goodwill and mutual understanding between our peoples. I thank the Government, Universities, employers and people of Turkey, who have extended their hand of friendship to our diaspora here. This people-to-people link is a great asset in the building of closer bilateral relations between our two countries. 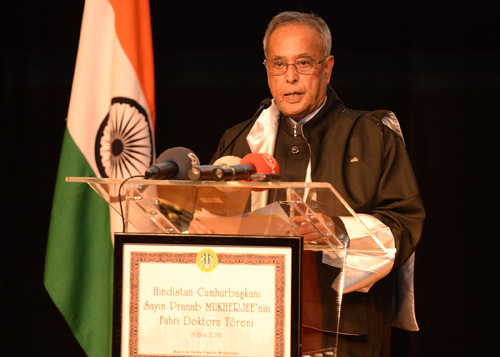 The statement read out by the Dean of Political Sciences, Professor Dr. Emra Cengiz, explained that the conferment of the Honorary Degree, Doctor of Letters, Honoris Causa, to me was on account of my achievement as someone who has spent decades in political life and contributed to governance and democracy in India. While I am humbled by this honour, this recognition, in my view, is due to the Indian nation and its people. India is a developing economy. It has pursued a democratic model of governance to provide opportunity for the development of every individual. India’s democracy is an inspiration to the forces of liberty around the world. When we started our journey of democracy in 1947, we were a new nation with a handful of challenges. We have overcome trials and tribulations and grown in strength to be a vibrant democracy today. Our democratic foundation is built on the three pillars of Parliament, the Executive and the Judiciary. The Parliament is a sacred institution that reflects the will of the people. The Members of our Parliament are the chosen representatives of the people who carry their hopes and aspirations and resonate their grievances. The accountability of the Executive to the people for its actions is exercised through the Parliament. We share with Turkey a deep commonality in our respective political structures. The success of our democratic institutions lies in responding to the challenges of our time and the hopes and aspirations of our people. They have to usher in the change and achieve the progress that we desire in our two countries. A key factor that can contribute to its achievement is Good Governance. Nations are according this goal more importance than ever before because of its inseparable link to social welfare and public good. Absence of good governance has been identified as the root cause of many of the serious deficiencies in societies. It robs the citizenry of their security, and of their social and economic rights, ironically established for their welfare and collective good. Good governance is critically dependent on the existence of some fundamental pre-requisites. At the core is the inviolable adherence to rule of law and delivery of justice. From these principles would emanate the existence of participatory decision-making structure, transparency, responsiveness, accountability, equity and inclusiveness. This would particularly imply the existence of a corruption free society and the presence of adequate avenues especially for the marginalised sections to have a definitive role in decision-making. In brief, good governance means the existence of an elaborate architecture that has the good of the people as their only foci. Stability, growth, progress—all this could only be achieved if we set the right priorities and execute bold policy measures to achieve them. I believe good governance ought to be the essential, the most basic philosophy with the rule of law and justice being the most important tenets of good governance. Three days ago, on 2 October, we marked the 144th birth anniversary of Mahatma Gandhi, the Father of the Indian Nation, who shaped our liberation struggle and for whom Mustafa Kemal Ataturk, the founding Father of your great nation had a special affection. We are aware that political leaders from both countries have an abiding mutual admiration and empathy as well as respect for Mahatma Gandhi. His philosophy of tolerance and self-restraint had a big impact on how India has administered itself over the past six and half decades with democratic governance. The value system propounded as part of his philosophy included sincerity of effort, honesty of purpose and sacrifice for the larger good. As I look around the world as someone who has lived on this planet for close to eight decades and as a Gandhian, I ask myself whether the ideals of patriotism, compassion, tolerance, self-restraint, honesty, discipline and respect for women are prevalent to the extent that they should be. I have endeavoured in my private and public life to contribute to these very ideals, which I believe, are the very essence of being human. Today, despite challenges, and occasional setbacks, India is no longer defined by her problems but by her achievements and the opportunities it offers. We have become a trillion dollar economy, the largest in Southeast Asia. We also have the largest middle class in the region. The last decade has seen India emerge as one of the fastest growing nations in the world. During this period, our economy grew annually at an average rate of 7.9 per cent. We are self-sufficient in food grains production, the largest exporter of rice and the second largest exporter of wheat. However, achieving equitable economic growth is still a challenge. So also is the complete elimination of poverty, although a declining trend in the poverty rate is clearly visible. Rapid creation of employment opportunities is an essential aspect of good governance. It is the approximately 350 million middle-class Indian citizens that have put India on the world map over the past two decades or so. In my Address to the Indian nation on the eve of 15th August, which marked the 66thAnniversary of our Independence, I referred to the need to provide our citizens entitlements backed by legal guarantees in terms of right to employment, education, food and information. We also need to ensure that these entitlements lead to real empowerment of the people. It will be essential to develop and sustain robust delivery mechanisms to make these legislations work. Our trajectory of high level growth will need to be sustained. Our continued success will need to be earned. In spite of our achievements during these transformational decades, there remains much work to be done. Indeed, sustaining India’s transformation will require the hard work and diligence of the country’s people, and particularly, good governance that its leaders have to steer. We will have to also strengthen the rule of law and good governance practices. We will have to ensure harmonious relations among our diverse ethnic and religious groups which, in a secular polity, is of supreme importance for nation building. We have learnt the difficult way that unless there is peace at our borders, development, and harmony cannot be achieved. India and Turkey live in extremely difficult geographies, and both of us are aware of the grave challenges to our security, internal as well as external. However, I am sure you would agree that India’s commitment to peace is unfailing. We continue to sustain moderation, pluralism and tolerance in our society. I certainly hope that with all this, in 2047—after one hundred years of independence—my vision of an India fully transformed into a democratically mature, stable and peaceful nation with freedom and opportunity for all will become a reality. It will be an India that is economically prosperous at all levels of society. In 1947, with an India coming into being after two centuries of colonial rule, many would have thought this vision as being far-fetched, but as envisioned by our national leaders, I am proud to say that today, this is a future well within our reach. I am happy that the idea of 'India’ has withstood the vicissitudes of time and presented itself as a secular, socialist, democratic republic, one that is non-aligned, non-violent and peace-loving as envisioned by the Father of our Nation, Mahatma Gandhi. Our friends around the world, like Turkey, have contributed to making such an idea become a reality.